← Chief Martin Agbaso formally joins APC!! 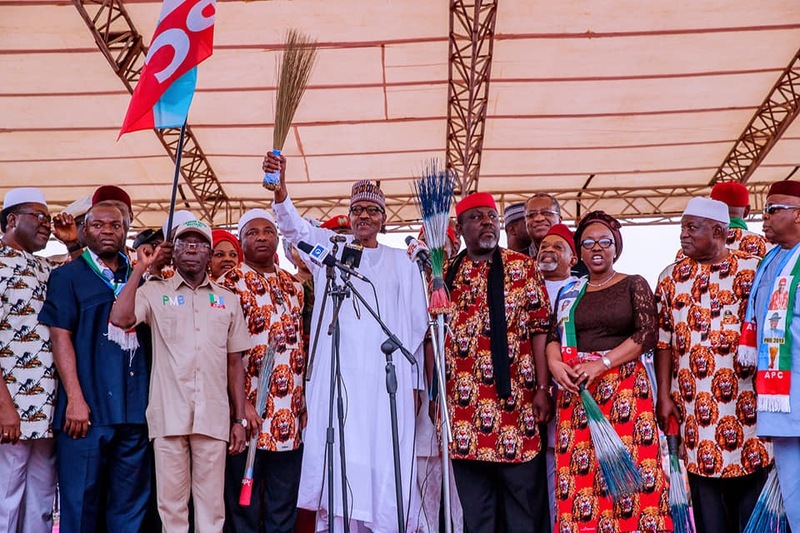 President Muhammadu Buhari, the APC presidential candidate while addressing the mammaoth crowd of Imo APC supporters at the it’s Presidential rally held at Dan Anyiam stadium today condemned in unequivocal terms the display of anti party disposition of governor Rochas Okorocha and his supporters and advised them to refrain from destroying the party. President Buhari urged them to instead of constituting nuisance and distractions should be courageous to join the candidate of their choice in his respective party. He emphasized that APC as a disciplined political party doesn’t condone any act of insubordination and rascality, hence any member not willing and prepared to subject him or herself to the supremacy of the party leadership is at liberty to leave and vote candidates of his or her choice. Speaking earlier, the national chairman of the ruling party His Excellency, Comrade Adams Oshiomole, while introducing the Imo APC governorship candidate Distinguished senator Hope Uzodinma to Imo people maintained that the party is not in alliance with any political party, insisting that APC as political party has the capacity, spread and grassroots following to win all its elections as such doesn’t need the alliance of any party. The governorship candidate of APC in his acceptance speech while expressing his gratitude to the good people of Imo State for their confidence in his capacity to revive the dwindled socio-economic fortune of the state, appealed to them to come out enmass on February 16 to vote for the second coming of President Mohammadu Buhari. The rally which marked the beginning of Rochas Okorocha’s journey into political oblivion as he was roundly rejected by imolites who booed him at every even opportunity chanting different uncomplimentary songs against him. Indeed Rochas began his journey to early political retirement on a bad note.